Morgan Ritchie premieres his new play in The Seagull. Photos: T. Charles Erickson. I suppose it had to happen sometime, but I'm sorry to report that director Maria Aitken, who has helmed three superb productions at the Huntington in a row, at last has had a misfire with her elegantly appointed but ultimately unfocused production of Chekhov's The Seagull. The reasons may not be hard to discern. 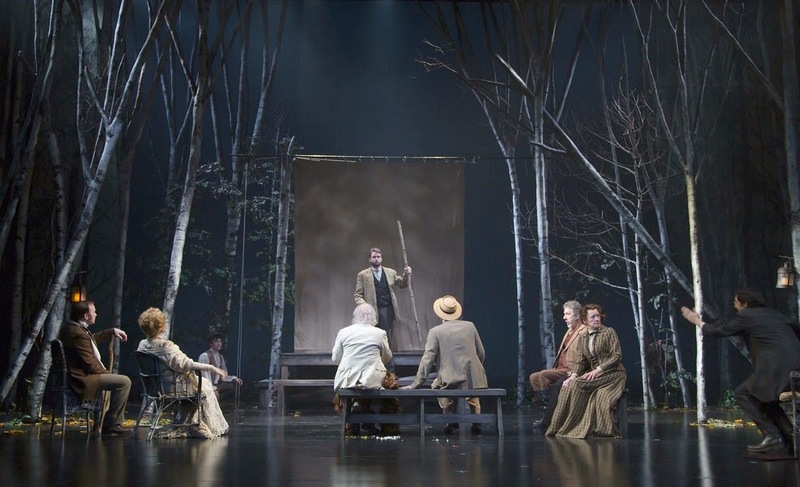 Just as casting is crucial to all directing, so it must be particularly precise in this ensemble, as Chekhov's breakthrough depends on several dramatic "cells" clicking into place (and against one another) with exquisite balance and clarity. But Aitken basically inherited her cast from the great Nicholas Martin, who had to step down from the production a few months ago, but who had already cast his long-time associate Kate Burton as leading lady Arkadina, and her son Morgan Ritchie as her character's long-suffering offspring, Konstantin. 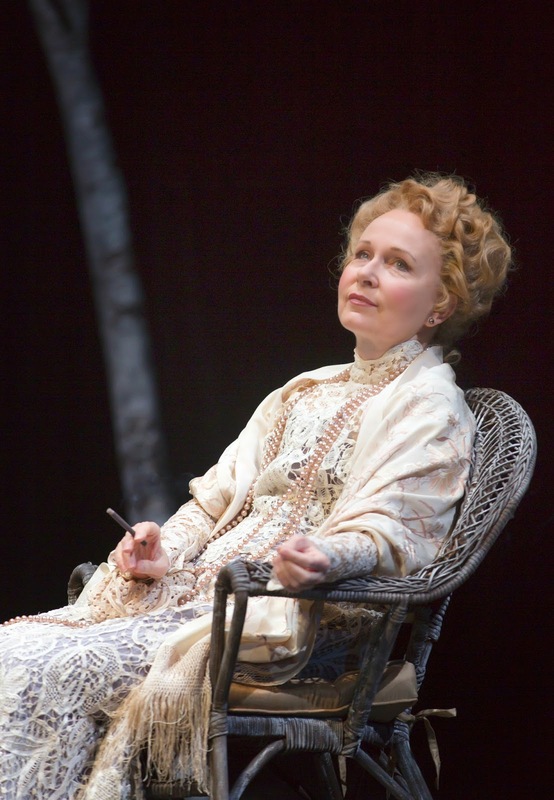 Kate Burton relaxes (briefly) as Arkadina. And my gut tells me Aitken just couldn't work around the limits of that duo. Burton has long fancied herself a Chekhov actress - and no one has ever told her otherwise - but her specialty is crisp competence (as she has demonstrated on Grey's Anatomy and elsewhere), which is just about as far from the neurotic gestalt of Chekhov's grande dames as you can get. Indeed, I recall that in Martin's Cherry Orchard, the idea that Burton would have blinked before carving up her orchard for condos was practically laughable. Still, Burton's better here than she was there; Arkadina's egotism can be read as a busy housewife's bustle, and Burton gives it a witty spin, while laying on the knowing jokes about her vanity. Which is all well and good, and carries the performance; but the underlying neediness of the character - the narcissism that makes her monstrous - I'm afraid goes missing. Which is bad news for Morgan Ritchie, as it gives him little to work against as her impulsive son - doubly bad news, actually, as he reads as less neurotic than his mother, when if anything Konstantin is more neurotic than his own. So while Burton at least swims, Ritchie slowly sinks. It's not that he's a bad actor - but the passionately nursed emotional wounds, the frail but burning ambition, and the swooning infatuation that make Konstantin spark and sputter in so many scenes - well, none of that hyper-sensitivity comes easily to Mr. Ritchie. But we must bow to the prerogatives of nepotism these days, it seems, so that's the way it is. And to be honest, the rest of the cast is less than perfect - or at least less than perfectly matched. Auden Thornton, for instance, struck me as an interesting young actress, but she merely flaps about as Nina, the eponymous "seagull," and not only because she's unsupported by Ritchie (or Ted Koch's monotonous Trigorin); she simply hasn't found her own way down Nina's path through wrecked illusion to desolate determination. Other good actors miss the mark slightly; our own Nael Nacer doesn't quite whine enough as Medvedenko, and Don Sparks isn't nearly as crude as Shamrayev should be. But there is some memorable work around the edges of the ensemble. I usually think of Masha as far more "goth" in style than the no-nonsense Meredith Holzman, but Holzman slowly won me over. The reliable Nancy E. Carroll likewise found the jealous twist in the dejected Paulina's sorrow, and Marc Vietor, though perhaps a shade lighter as the seductive Dr. Dorn than one usually finds, certainly made a convincing Don Juan. Best of all was Thomas Derrah's declining Sorin; a perfect Chekhovian mix of self-aware intelligence and useless fuss, his was the best performance of this particular role I've ever seen (including the one I directed). 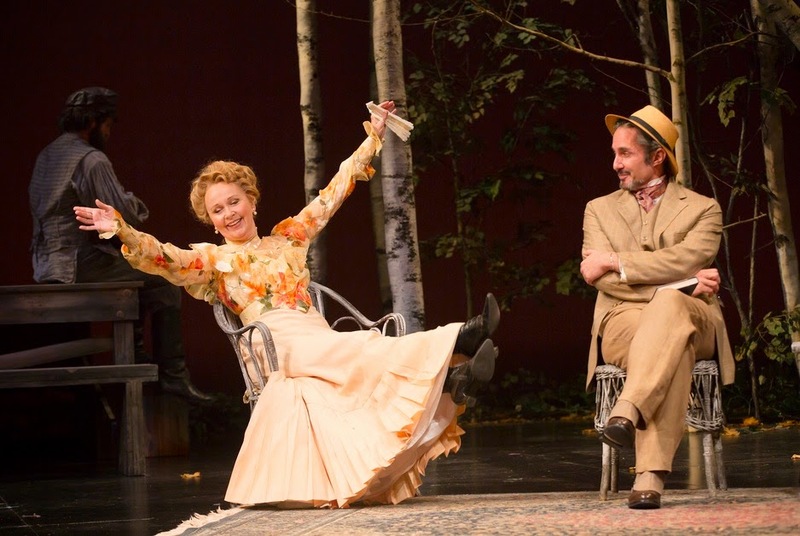 Kate Burton and Marc Vietor enjoy a sunny moment in The Seagull. So about half the ensemble is there - it's just not the leading half. For her part, Aitken cleaves to a fairly traditional interpretation, although she leans a bit toward the postmodern tendency to emphasize the comedy in this exquisitely brooding concoction - an approach which always seems to work well until the devastating final act, at which point it suddenly doesn't work at all. Oh, well. Until the professors see reason, I suppose we're stuck with their truncated interpretation for the time being. At least the set and costumes are at the Huntington's customary high standard (although again much in the vein of Martin's Orchard). The real news of this version, actually, is its translation. I've heard Paul Schmidt's work praised in the past, but haven't seen any of it till now; and I have to say it's the best of the so-called "American" Chekhov translations available, utterly blowing away the clumsy attempts by Mamet and other writers. The case against Schmidt is that his colloquial style tends to erase subtle indications of Russian class and caste (which British versions tend to illuminate). I think I agree with that assessment, but these issues matter somewhat less in The Seagull than elsewhere in Chekhov's "Big Four," and are easily outweighed by the ease and wit of Schmidt's rendering. Note to other companies contemplating Chekhov: check out Schmidt! Spot on. And I thought it the least effective third act of a Chekhov play that, perhaps, I've ever seen. There was none of the complex embittered relationship between mother and son, no grande dame histrionics in her "scene" with Trigorin and nothing at stake in Trigorin's fall for Nina.